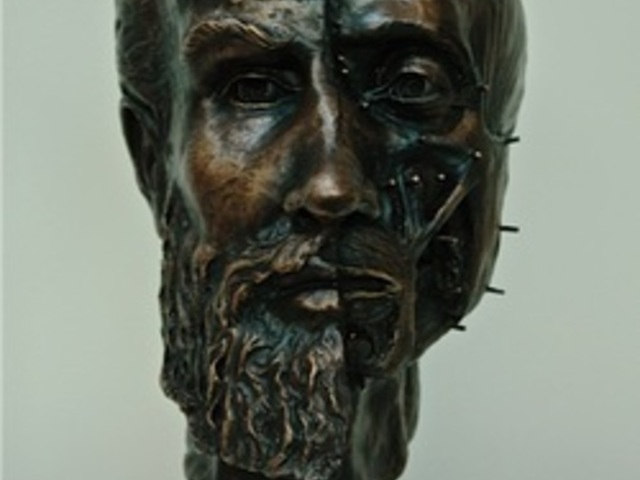 Purchase of bronze bust portrait of Andreas Vesalius by Richard Neave and Pascale Pollier to donate to Saint Louis University. The sculptor Pascale Pollier created this work in collaboration with facial reconstruction expert Richard Neave, who is the founder of the Manchester method of Facial Reconstruction www.rn-ds-partnership.com. The resulting life size sculpture, half anatomical reconstruction and half portrait head, is a fitting tribute to the great professor of medicine, often known as the Father of Modern Anatomy. The sculptor has made an edition of twelve of these bronze casts, and has already sold nine of these–as of 14 SEPT 2014 THERE ARE ONLY THREE CASTS LEFT!